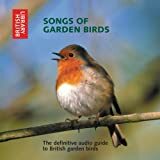 A very popular audio guide which helps to identify the bids that come to the UK's gardens—not just the early morning minstrels that wake us with their songs, but all those that sing around our homes at any time. Features recordings of the typical songs and calls of the 52 species most commonly found in British gardens. This CD presents an introduction to learning and identifying bird sounds in your garden. Includes an introductory booklet.